Manchester City boss Pep Guardiola believes some critics will write his Manchester City side off as a failure if they do not win the Champions League. Manchester City have spent more than £500million on players since Guardiola took charge at the Etihad Stadium in 2016. 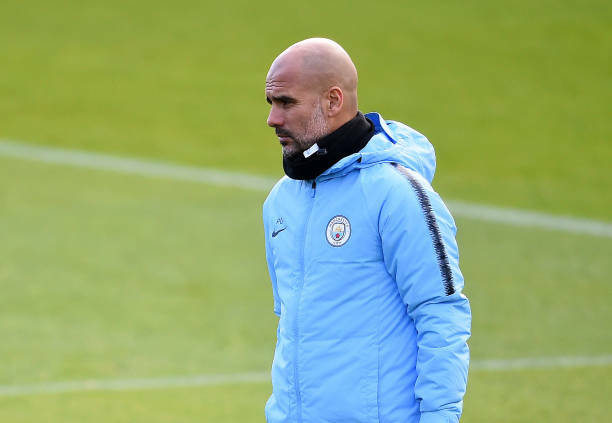 They won the Premier League in some style last season and are again top of the table this season, but Guardiola knows expectations are high. “For the people who don’t love us too much, who use money as an argument, then we have failed if we don’t win the Champions League. “For the others, especially our fans who say they enjoy watching our games and enjoy what we are doing, I’m pretty sure they won’t have regrets about what these guys have been doing every three days for the last 15 months. “That is the best compliment, the best success the team can have. But, of course, we want to qualify, continue our level in the Premier League and arrive in the best possible condition with everybody fit to challenge again to go quite far. Manchester City will continue their Champions League campaign at Lyon on Tuesday and can secure their place in the last 16 for a sixth successive season with a draw at the Groupama Stadium and a victory would seal top spot in Group F with a game to spare. Guardiola’s side have recovered well by snatching three successive victories in the competition since suffering a surprise 2-1 loss to Lyon at the Etihad Stadium in September. They now lead the group by three points from Lyon, who have drawn their last three fixtures. But Guardiola will be caution of what occurred last time the sides met, is not taking anything for granted against a side who can also make sure of progress with a victory. “They were better. In the first half they were better than us. They have a strong team. They have top, top players. “When you lose the first game at home the group stage becomes so tough but we did our job, winning the next three and the other opponents drew. Bernardo Silva, Ilkay Gundogan and Gabriel Jesus all failed to travel due to knocks but City are hopeful the problems are not serious.